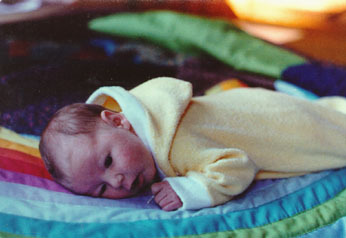 Needle crafts have been a part of my life since before I was even born. I have sewn since childhood and over the years have gone through stages of embroidering, crocheting, knitting and now quilting. 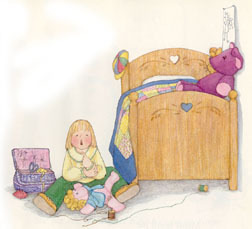 It seems very fitting that I have come to the point of using quilts as illustrations because one way or another my needlework has made it's way into the books since the beginning. On this page you will see examples of my work and how it has fed into my books and vice versa. 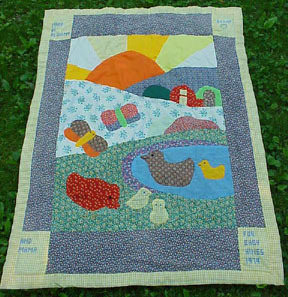 The first quilt I remember was on my bed when I was a little girl. It was made of woolen squares, about four inches on a side. The squares were mostly dark colors, but there were a few that were bright pink, some red, pale blue and a kelly green. The fabrics probably came from discarded coats and suits. Each square was tied in the center with colored yarn and the back was a dark plaid flannel. I remember it being heavy and warm. My mother says she probably made it, but she doesn't remember for sure. I know she was always making something when I was small; sewing clothing for all the family, hooking rugs, crocheting lace doilies. Mom always had at least one project going. My dad did, too, though it wasn't needlework. He did carpentry, auto mechanics, built go-carts, furniture, model ships, cars, and airplanes. I remember both of them trying new things and working to figure out how to do whatever it was they had in mind. In our house not knowing how was never an excuse not to try something. I followed their example from an early age. 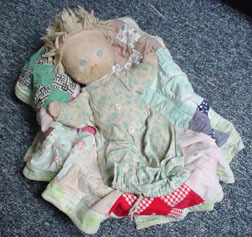 I remember making a stuffed dog from an old sock when I was about six years old, and a rag doll with rope braids. I went on to make clothes for my dolls, and my sister's dolls and eventually clothes for myself. I learned my first embroidery stitches from my German Aunt Mary when I was seven or eight, and went through a crewel embroidery stage when I was in high school. 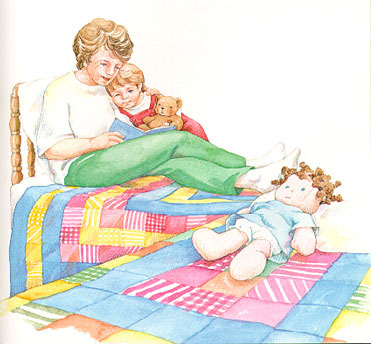 Making a Quilt for Mom: It was when we decided to give Mom a quilt from the whole family that I got seriously involved in quilting. 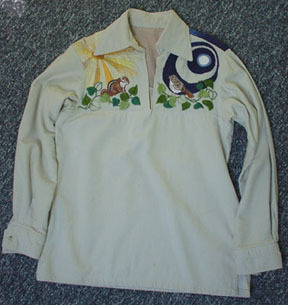 I did a lot of embroidery in my twenties, mostly on clothing, toys, and curtains for my daughters, Bethany and Sarah. 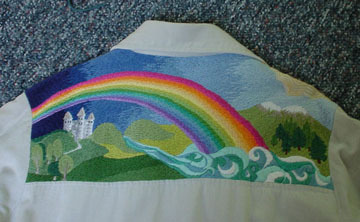 My most ambitious effort was this shirt I made as a gift for Gary. I finished it just in time for our wedding. People were amazed at the amount of work involved, but it seemed well within reason to me. While I was attending Pacific Oaks College I met a seventeen year old girl who was solidly embroidering a whole bedspread! That was amazing! You can see the shirt in my book, When We Married Gary . When I decided to make bedspeards for my girls I combined my embroidery skills with quilting to make these designs. I used a pattern for embroidered stuffed toys, which I then appliquéd onto the blue fabric. I added the tree embroidered with yarn and appliquéd leaves. The quilting in these is very minimal and done by machine. This one is Bethany's. Her little boy, my grandson Jacob, is holding it up so I can take the picture. Sarah still has hers, too. I'm surprised they held up as well as they have. When our third baby was coming I wanted to involve the two older girls in the preparations. We decided to make a quilt for the baby. The girls drew designs and together we came up with our pattern which we appliquéd using calico prints. Again the quilting is minimal, but this time it was all done by hand. 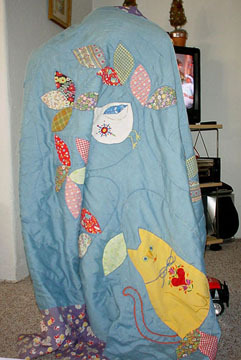 This quilt is also done primarily with appliqué. 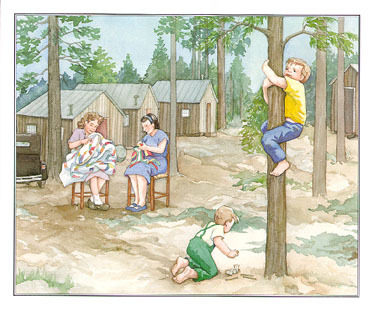 I worked on it when Lassen was a baby and gave it to my husband for Christmas. As you can see I wasn't into using little pieces at this point. 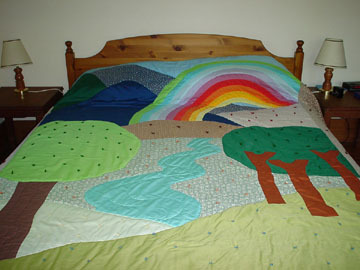 There is some hand-quilting but this bedspread is mostly tied with yarn, like the one from my childhood. As I recall the padding is old blankets. We really didn't have much money then so I did this as economically as I could. Here is Lassen lying on the quilt as I worked. She's in her 20s now, so I guess the quilt is, too. 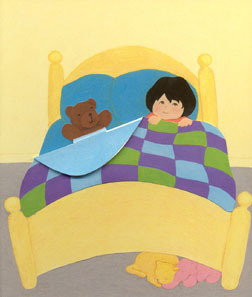 When Lassen was a toddler I started making her a cloth alphabet book. 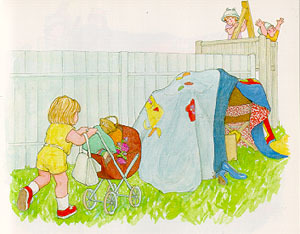 Some of the pages had activities such as strips of cloth hair to braid, shoes to lace, flowers to button on, and so on. It would have been a nice book, but it was a lot of work. Somewhere along the way I concluded it was too much work for a book that she would outgrow in a few months, so I sewed the pages together and make a quilt instead. It was a good idea. Lassen used it until she was twelve and hopes to pass it on to a child of her own someday. 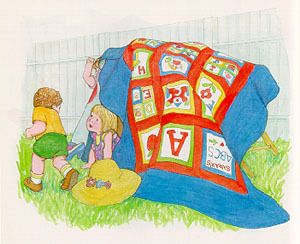 When I began making books, I enjoyed putting quilts in the illustrations. 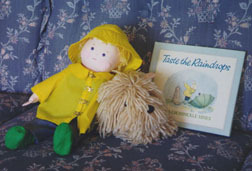 Taste the Raindrops , my very first book, has a quilt drawn with pen and ink. and so do Jackie and Carla in Jackie's Lunchbox . Here's another quilt in Rumble Thumble Boom ! 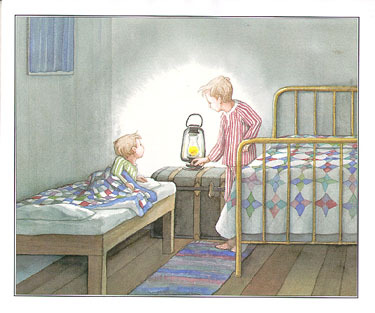 In Day of the Highclimber , Gary wrote about the mother's sewing and covers on the beds. 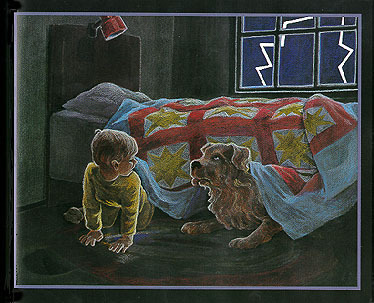 ... and quilts as the covers on the beds. 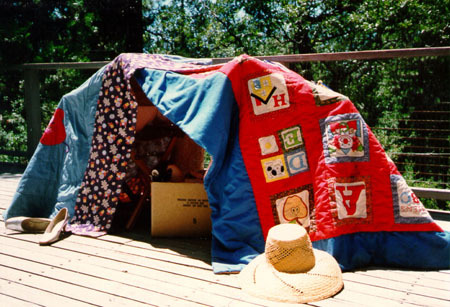 In Keep Your Old Hat Sarah makes a house with quilts and chairs. 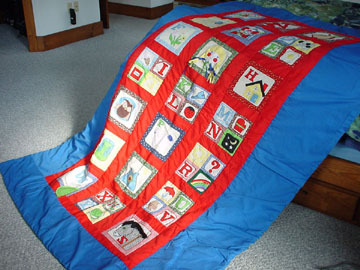 Do you recognize these quilts? 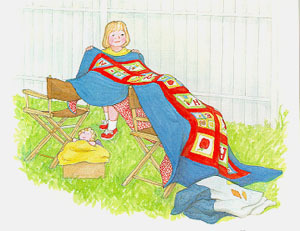 For these illustrations I borrowed the quilts off my kids' beds and built my own little house with quilts and chairs. Then I took photographs that I could look at to make my illustrations. 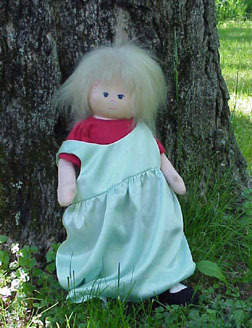 I loved dolls as a child and have never really outgrown them. I have made dozens of dolls for my three daughters, for nieces and nephews, children of friends and even sold quite a few at craft shows. 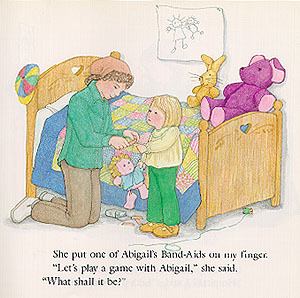 Abigail was a Christmas gift for Sarah when she was eighteen months old. Bethany got a brunette version named Penelope. Abigail was cute and adorable once, but as you can see, she's had many adventures. She was left out in the sprinklers, carried off by a dog, and fed chocolate pudding, just to name a few. She also needed mending on several occasions, one of which was the inspiration for my story Maybe a Band-Aid Will Help . Then she got lost in Don't Worry I'll Find You , and was Sarah's most faithful companion in Keep Your Old Hat . 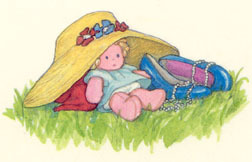 Doll and stuffed toy characters appear often in my illustrations and are featured characters in several of my books, including I'll Tell You What They Say , Moompa, Toby and Bomp , and most recently in Not Without Bear . 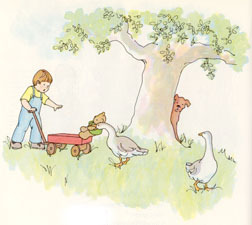 Sam's teddy bear gets snatched by a goose. 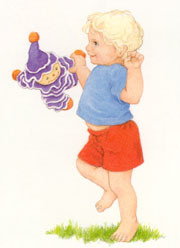 Toddler Toby and his pal, Bomp. Audrey tucked in bed, but "not without Bear." I enjoy making dolls that are characters from books. 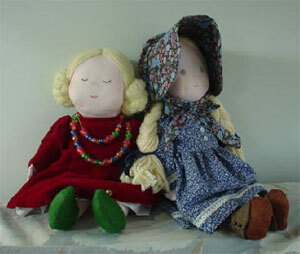 Below are the Fine Lady from Banbury Cross, made from a Joan Russell pattern, and Mary Ingalls which I adapted. Joan's patterns used to appear regularly in Woman's Day magazine. 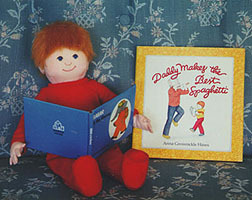 I have her book, The Woman's Day Book of Soft Toys and Dolls. Beth from Little Women is another Joan Russell pattern. 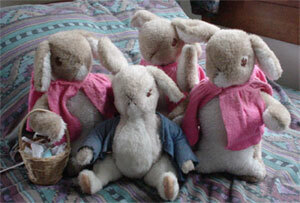 ...and Flopsie, Mopsie, Cottontail and Peter from The Tale of Peter Rabbit. 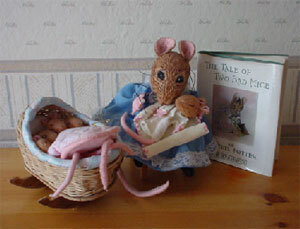 These patterns are from Margaret Hutchings, Toys from the Tales of Beatrix Potter. Most of these dolls and animal characters were given as gifts to my daughters and my mother. 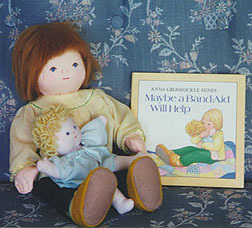 ...and Sarah and her doll Abigail from Maybe a Band-Aid Will Help . 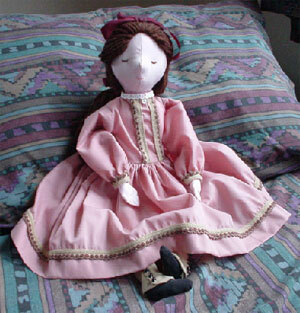 This is the doll I made for Lassen from Grandma Gets Grumpy . She's all dressed up in her fancy dress. 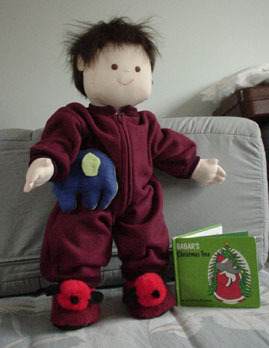 The last doll I made was this one for my grandson, Jacob, then 4 years old. Since Jacob is more of a car and truck sort of kid, I knew a doll wouldn't be his favorite thing, but I had to give him one anyway. 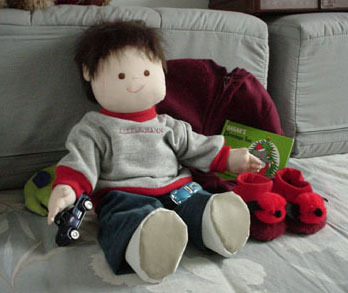 As you can see I gave the doll his own car and truck, a bedtime book, cuddly toy, PJ's and puppy slippers. Jacob's full name is Jacob Albert Mann. I called the doll "Little Mann", but Jake named him Andy. Andy does have his times of being a favored companion and has even gotten to go to kindergarten a few times this year. Maybe he'll star in a book of his own one of these days.